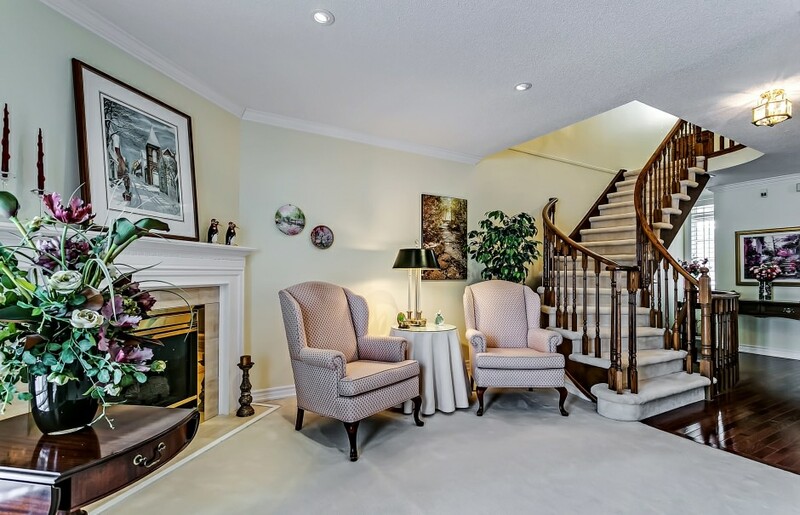 Bright, spacious townhome backing onto the scenic Millcroft golf course. Fantastic open concept layout with almost 2,300 square feet plus partially finished lower level. This home has been impeccably maintained with many luxury features throughout, including dark stained hardwood flooring, upgraded broadloom, crown moulding and California shutters. Eat-in kitchen with granite countertops and inside access to a true double-car garage. The separate dining room with central chandelier inset a plaster medallion opens to a great room with gas fireplace with stone surround, and double French door walkout to the serene rear yard and patio with natural gas BBQ hookup overlooking the first tee of the golf course with mature trees. Upstairs, double doors open to an oversized master bedroom with walk-in closet and five-piece ensuite with His & Her vanities, separate soaker tub, and walk-in frosted glass shower with bench seating and hand-held shower head. Two additional good-sized bedrooms with double closets share the main four-piece bathroom, with laundry conveniently located on the second level of the home. A partially finished lower level provides ample additional living space, including a recreation room with custom wet bar and mini halogen pot lighting, three-piece bathroom, and cozy office space. Low-maintenance living with all exterior maintenance included in condominium fee. Desirable development in an established neighbourhood. Fantastic package in beautiful Burlington!